The usual excellent printing by Cartograf of Italy. 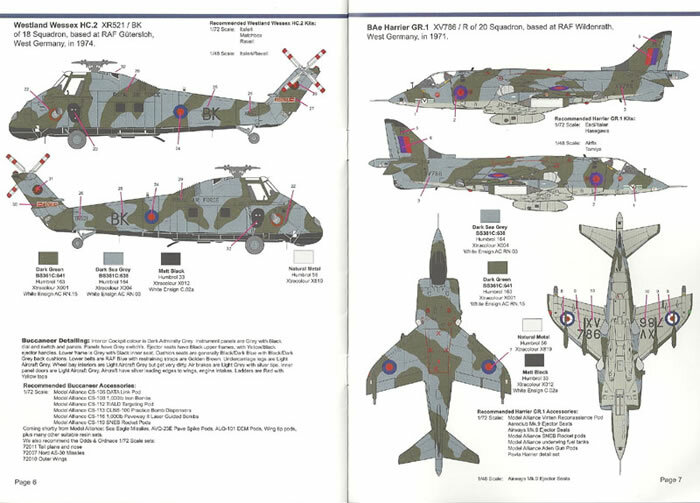 Detailed instructions covering all colour schemes for aircraft depicted. 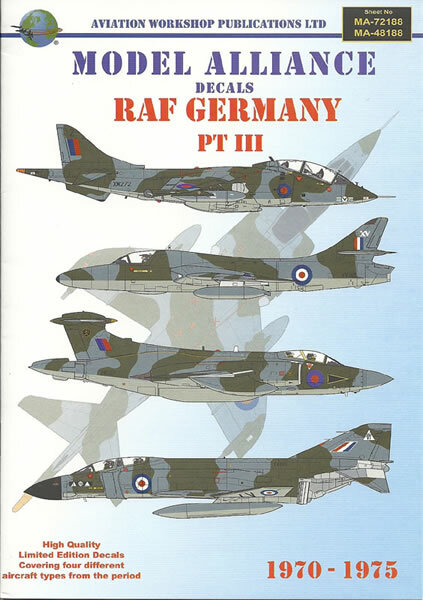 A seeming follow-up from their earlier RAF Germany 1970’s sheet (MA-48184), The Aviation Workshop has now released two new sheets in their Premier Decals Range, again focusing on RAF Germany units in the period from 1970-1975. This period is of great interest, highlighting a force that was nearing renewal. In the frontline alongside new Phantoms remained Lightnings and Hunters, whilst the revolutionary GR 1 Harrier still equipped frontline units. Low visibility had not yet fully taken a grip and variety of national markings and unit insignia could be seen. Interestingly both instruction sheets state they cover four different aircraft types, but this is erroneous as they both have five different aircraft types covered. All the above (except of course of the Chipmunk) are in Dark Green and Dark Sea Gray over Light Aircraft Gray disruptive schemes with the Wessex having a black underside. 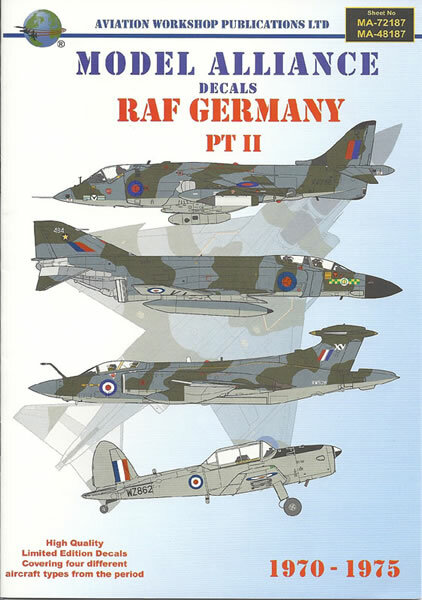 As with Part II all the subjects are in the Dark Green and Dark Sea Gray over Light Aircraft Gray scheme common in the RAF in the 1970’s except for the Lightning subjects which are in the unique Dark Green over Silver scheme adopted for the aircraft within RAF Germany. 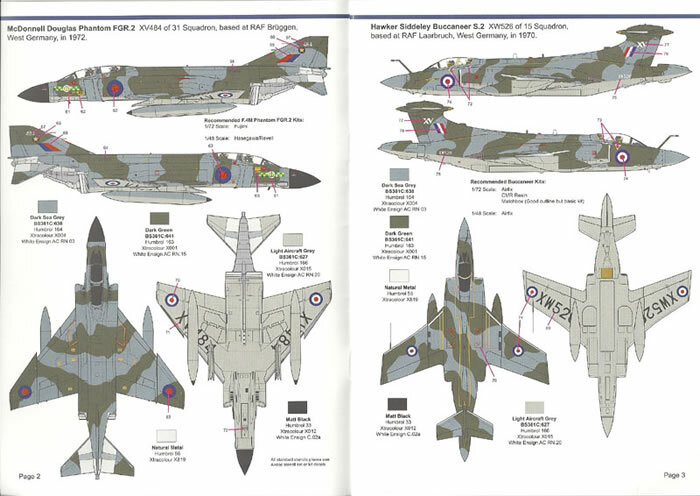 In summary the range of subjects provided on these two new sheets from Model Alliance / The Aviation Workshop are many and varied. 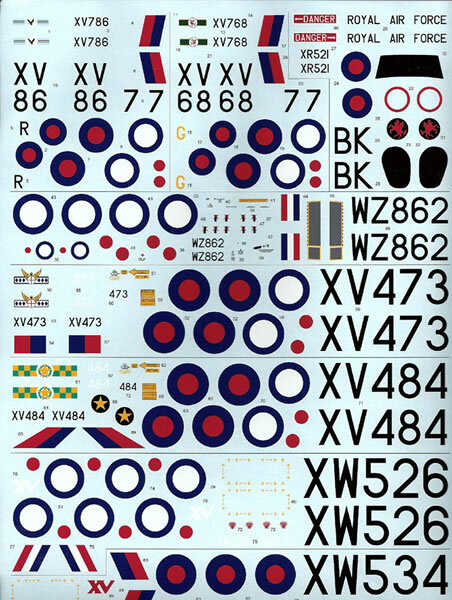 Model Alliance has provide all the roundels, serial numbers and individual squadron markings for all subjects on a large format A4 size sheet, making it possible for a dedicated modeler to use the entire sheet if desired. Perhaps the greatest challenge may be finding the appropriate kits to use – especially the extremely rare Aeroclub DH Chipmunk and Revell Wessex kits. In addition the Harrier GR 1 is really only available via two very old kits from Monogram and Tamiya which may also deter some. A pity as they are all very interesting subjects for those with an interest in RAF subjects. The decals are clearly printed with no issues noted and the Model Alliance instruction booklets are more than adequate for the modeler. 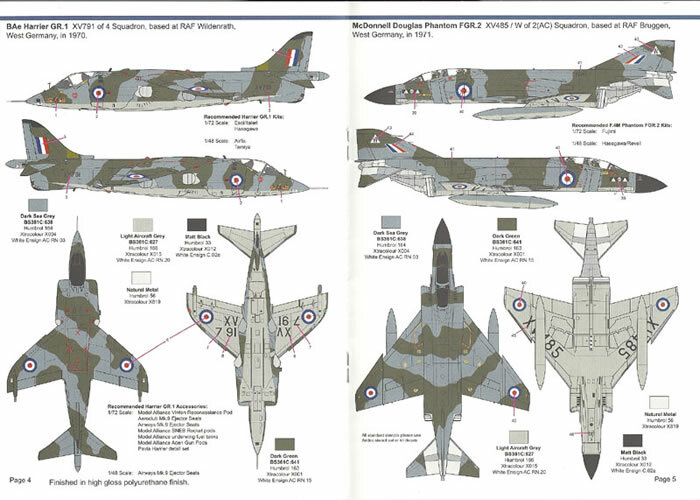 They provide clear full colour four view drawings of each subject with decal locations and colour call outs noted. Usually sheets like these accompany an Aviation Workshop publication but one was not immediately noticeable on their website. 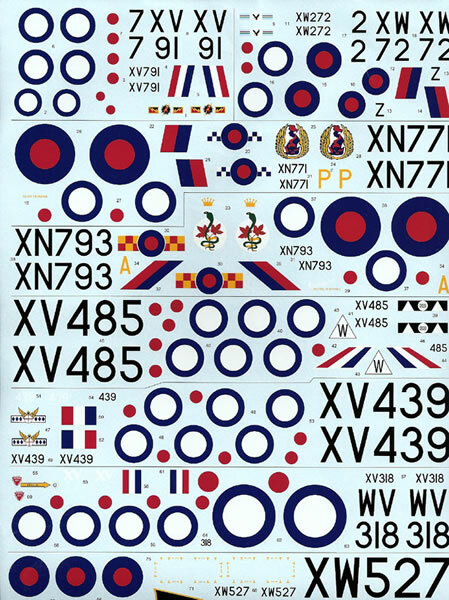 That said, the now three sheets covering RAF Germany subjects may hint at one in the future. These are two well executed packages of decals that should please many modelers of a British bent. Model Alliance products are available online from the Aviation Workshop.